June 15, 2006 - I supported Israel's disengagement from the Gaza Strip. However, the fears of the opponents of disengagement have been realized. Even though the Palestinians have demanded Israeli withdrawals, instead of meeting Israel's withdrawal from Gaza as a step toward peace they have taken advantage of it to use Gaza as a staging area for rocket attacks against Israeli cities. I have already reported on these attacks, and they have been increasing. No country can allow unchallenged rocket attacks against its civilians. So Israel has been taking measures to try to stop them. On Friday June 9, Israel was shelling locations in the Gaza Strip from which rockets were being fired at Israeli cities. During the previous week over 100 Qassam rockets had been launched from the city of Beit Lahiya on the north shore, hitting a school, a kindergarten, and private houses in Israeli territory. On that day at Beit Lahiya seven Palestinian civilians died. Israel expressed deep regret for these deaths. This did not stop the Palestinians from accusing Israel of killing them intentionally. Palestinian Authority President Mahmoud Abbas called the deaths a "bloody massacre." He accused Israel of "state terrorism" and trying to "wipe out the Palestinian people." Hamas used the incident as reason to end a 16-month cease-fire. It issued a statement saying "The Israeli massacres represent a direct opening battle, and that means the earthquake in the Zionist cities will resume. We will respond at the appropriate place and time." Hamas spokesman Ghazi Hamad added in a telephone interview: "They killed innocent civilians who were enjoying their time on the beach and have nothing to do with military affairs, so I believe that we the Palestinians, including Hamas, have the right to respond and defend ourselves." To Hamas, "responding" and "defending ourselves" mean doing precisely what they accuse Israel of doing: targeting and murdering civilians. And so during that weekend Hamas fired a total of 31 Qassam rockets at populated areas in southern Israel, including Sderot and Ashkelon. Sderot had to close its schools and kindergartens. A number of Sderot residents were wounded by the rockets. One rocket hit a building in Ashkelon's industrial zone, where the potential for destruction is enormous. A number of buildings, including a factory, were damaged. Ever since the time of Muhammad, cease-fires or hudnas were made to be broken. 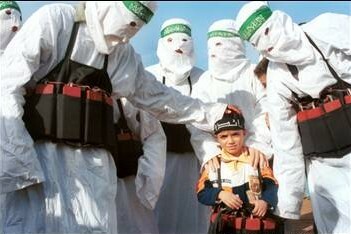 This time Hamas seems to have found the perfect pretext. But at the very worst the civilian deaths were accidental, caused - if the Palestinian complaint is to be believed - by an Israeli shell that missed its intended target, a Palestinian rocket-launching site. How does this justify rocket after rocket and bomb after bomb that Palestinians intentionally use against Israeli civilians? The Palestinians cry over the deaths of "innocent civilians who were enjoying their time on the beach and have nothing to do with military affairs." Of course such deaths are tragic. But Israel does not target such people, and expresses regret when they are hurt. How many innocent Israelis have the Palestinians intentionally killed, people enjoying their time on the beach or in the restaurant or in the shopping mall or on the bus? And when those people die, the Palestinians express not regret but joy and celebration. Who is trying to "wipe out" whom? Israel has just withdrawn from land in Gaza that the Palestinians are now using as rocket bases to try to clear out southern Israel. Islamic Jihad has been smuggling Katyusha rockets - heavier and deadlier than Qassams - into Gaza to do the job more effectively. Palestinian rockets are launched from populated areas, leaving Israel the dilemma of either allowing its civilians to remain free targets or risking casualties by fighting back. Israel's goal is taking out the rockets that are killing innocent people. The Palestinians' goal is killing innocent people. And now the Palestinians are outraged by the death of innocents. It should be obvious that even if an Israeli shell did kill Palestinian civilians accidentally, it is no excuse to launch a terror campaign whose express purpose is mass murder of Israelis. Even so, much evidence now suggests that Israeli fire was actually not responsible for the Palestinian deaths. Hamas has found another false excuse to break a cease-fire it most likely had no intention of keeping. Instead of calling attention to the remains of the Israeli shell that presumably caused the casualties, the Palestinians have been removing evidence from the scene. Shrapnel found in the bodies of two of the wounded Palestinians treated in Israeli hospitals was not from any ammunition made in Israel. There was no crater at the site large enough to account for the landing of an Israeli shell, but it was consistent with the type of mines that Hamas had been planting in the area. Normal activity on the Gaza beach continued until at least a quarter hour after the Israeli shells were fired. Aerial photographs support the view that neither Israeli Navy shells nor ground artillery shells were responsible for the explosion. A Palestinian security source has stated that Hamas operatives cleared debris from the site of the explosion in order to impede the Israeli investigation. Human Rights Watch has disputed Israel's report with one of its own, claiming that the evidence points toward Israeli responsibility for the fatal blast. However, the HRW report relies heavily on Palestinian sources, and the Palestinians have not hesitated in the past to spread disinformation about crucial events like this one, including the so-called "massacre" at Jenin and the shooting of Muhammad al-Durrah. Specifically, HRW claims that fragments of artillery shells of the type Israel uses were found at the explosion site, but cannot rule out the possibility that these fragments may have been taken from other locations and planted there. As previously noted, shrapnel was found in some of the victims that is inconsistent with any type of Israeli ammunition currently in use. At the very least, there is no conclusive proof that Israeli fire caused these Palestinian civilian casualties. Most of the evidence points the other way. Whether or not an Israeli shell caused the explosion, the entire debate carries a grotesque irony. The Palestinians are trying very hard to make a case, against the preponderance of the evidence, that an Israeli shell missed its intended target and killed a number of civilians. They find this such a cause for outrage as to justify breaking a cease-fire and resuming their own attacks on civilians. They complain about injuries to innocent people who were minding their own business, trying only to live their lives. The irony of hundreds of Qassam rockets fired at Israel, intended precisely to kill other innocent people, seems totally to escape them. The nature of the debate itself underscores once again that unlike the Palestinians, Israel does not target civilians intentionally. Israel's task of defending itself is like threading a fine needle. By firing missiles at Israeli towns from densely populated areas within Gaza, the Palestinians use their own civilians as human shields and make Israel's job exceedingly difficult. The Qassam rockets - probably soon to become Katyushas - cannot be allowed to fly at will. Israel must try to stop them, but separating the rockets from the civilians close by is a formidable challenge. While mistakes have occurred, the fact that there have not been many more is testimony to Israel's adherence to moral principles that are completely foreign to the Palestinians. If a Palestinian mine or other similar device caused the explosion, it would not be the first time the Palestinians have used such an occurrence to justify escalating attacks against Israelis. The same thing happened last fall when the mishandling of explosives by members of Hamas resulted in the deaths of 21 people at the Jabalya refugee camp in Gaza. Hamas lied about the explosion, accused Israel of causing it, and, in retaliation for something Israel never did, shot 40 Qassam rockets at the town of Sderot. Even if the truth about the Gaza beach explosion could be known with absolute certainty, it would be totally irrelevant. "Beach Strike Shakes Hamas Cease-Fire." CNN.com, June 9, 2006. Cohen, Mike. "Israel Completely Cleared of Gaza Blast." Galilee Institute, June 13, 2006. Erlanger, Steven. "Mideast Truce Threatened After Shelling." New York Times, June 9, 2006. Erlanger, Steven and Ian Fisher. "Israeli Airstrike Kills 8 Civilians, Enraging Palestinians." New York Times, June 13, 2006. "Gaza Beach Libel." HonestReporting.com, June 13, 2006. Jpost.com Staff. "Palestinians: Hamas Cleared Site of Gaza Explosion." Jerusalem Post, June 11, 2006. Jpost.com Staff. "Sderot Closes Schools Following Heavy Kassam Fire." Jerusalem Post, June 11, 2006. Katz, Yaakov. "IDF Says It's Not Responsible for Gaza Beach Blast." Jerusalem Post, June 13, 2006. Katz, Yaakov and Herb Keinon. "IDF Probe Chief: Our Case Is Airtight." Jerusalem Post, June 15, 2006. Keinon, Herb. "Gissin: Don't Blame Israel First." Jerusalem Post, June 11, 2006. Leyden, Joel. "Hamas Murders Children in Palestine, Blames Israel." Israel News Agency, June 11, 2006. Facts surrounding the Gaza beach explosion continue to be disputed. However, an article in the German Suedduetsche Zeitung examines several problems in the Palestinian account. There are inconsistencies in the statements of the Palestinian cameraman, suggesting he may even have helped stage much of what he was shooting. Human Rights Watch investigated the explosion a day after it happened, leaving time for the Palestinians to remove evidence from the scene. Indeed, in some of the cameraman's pictures one can see Hamas operatives apparently collecting pieces of evidence. While it continues to criticize the Israeli investigation, Human Rights Watch conceded that it cannot contradict that investigation's findings. In any case, the heavy emphasis given to what caused the Gaza beach explosion is entirely misplaced. Even Human Rights Watch does not accuse Israel of targeting civilians intentionally. The Palestinians have focused on this incident to deflect attention from the true cause of this conflict, which is their unprovoked rocket attacks on Israeli cities. Whatever the reason for the tragedy on Gaza beach, it would not have happened if Israel had not had to put a stop to those attacks. No country on earth would be expected not to respond to repeated attacks on its cities. Why should Israel be an exception? The Qassam attacks should not be dismissed. They have done real damage and killed innocent people. Ami Isseroff's report, cited below, documents the damage and the people killed. Yet there has been no international outcry for an investigation into the Qassam attacks. The focus by the Palestinians and their supporters on the Gaza beach incident, while ignoring or trivializing these attacks, is a moral obscenity. The Gaza beach incident could have been easily prevented - if the Palestinians had responded to Israel's withdrawal from Gaza with an equivalent gesture for peace, instead of using it as an opportunity to start an escalating rocket war. To deny Israel the right to defend itself while one looks the other way from these Palestinian atrocities shows not only a flagrant double standard but also a racist attitude toward the Palestinians, who are not even expected to behave like civilized human beings. Meanwhile, as long as Israel keeps attacking empty buildings in Gaza, the Palestinians cannot so easily launch rockets at populated cities. Isseroff, Ami. "Collective Punishment: Qassam Rockets Kill - the Agony of Sderot." Zionism and Israel Information Center. Katz, Yaakov. "Human Rights Watch Admits Unable to Contradict IDF." Jerusalem Post, June 19, 2006. Schmitz, Thorsten. "Der Krieg der Bilder." Suedduetsche Zeitung, June 16, 2006. Trans. Ami Isseroff, "Pallywood: German Expos� of Palestinian Media Hi-jinx in Gaza Beach Tragedy." Zionism and Israel Information Center.